Nearly 50 years after the Beatles led the British Invasion, the Stones, Who, Zeppelin and McCartney are making big news again. The Rolling Stones are gathering no moss. 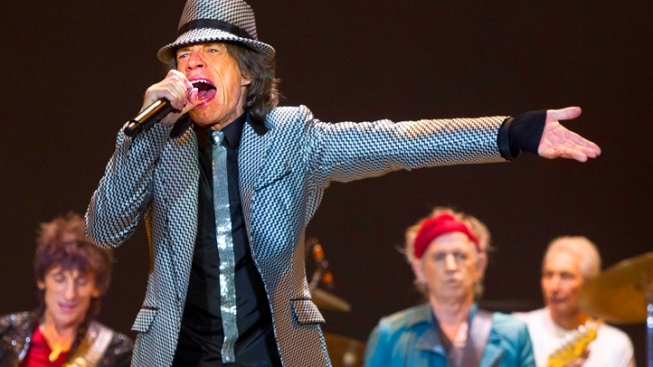 What might or might not grow into a full-blown Stones 50th anniversary U.S. tour rolls into Brooklyn Saturday night. Mick and Co. are set to play the new Barclays Center, less than a month after The Who's powerful, arena-shaking performance of "Quadrophenia" christened the venue in the name of classic British rock. A Who musical cameo during Wednesday's Grammy nominations special on CBS Wednesday night proved a highlight of a show filled with relative youngsters. The appearance came two days after the surviving members of Led Zeppelin visited "Late Show With David Letterman" in the afterglow of receiving Kennedy Center honors from President Obama. Zep's Robert Plant, Jimmy Page and John Paul Jones went on Letterman to hawk a CD and DVD set of their 2007 reunion concert, which they swear, unfortunately, will be their last performance. But next week's 12/12/12 Sandy benefit concert at Madison Square Garden boasts a bill that includes The Who and Paul McCartney, who is set to bring his Hofner bass to "Saturday Night Live" Dec. 15. Nearly 50 years after the Beatles led the British Invasion, the Stones, Who, Zeppelin and McCartney are still making big news – and in most cases, music. The endurance and enduring appeal of the surviving members of the four most successful British bands that shot to fame in the 1960s is worthy of, to paraphrase Zeppelin, a celebration day. There's something both comforting and exhilarating in timeless music that packs the same youthful punch as when it debuted on vinyl – even if the creators are now in their sixties and seventies. The Big Four also give us an increasingly rare intergenerational pop-culture experience. The Who's "Quadrophenia" gig in Brooklyn drew an audience ranging from teens to sixty-somethings, all wind-milling in unison with Pete Townshend, who, as a 20-year-old, wrote the lyric, "Hope I die before I get old." Sadly, each of the major Brit band lost at least one member long before they got old, physically or otherwise. We've just passed the 11th anniversary of George Harrison's death. As the Stones hit the stage Saturday night, Beatles fans will gather about eight miles away at Central Park's Strawberry Fields to mark the 32nd anniversary of John Lennon's murder. Great music, though, can lift us past nostalgia and bittersweet longings for times lost – and provide new moments to be cherished and shared. Which is probably why, even more than the megabucks they probably don’t need, that these rockers roll on. The latest British Invasion wave marks a sign that "My Generation," at least when it comes to classic rock, has morphed into "Our Generations."